Duct sealing – by far the smartest energy saving solution around. Remember when we were all taught about the 4 basic food groups and how meat and milk were essential to our good health? The rules on that one have certainly changed. How about the rule that bigger is better? Tell that to cell phone manufacturers, car companies and laptop makers. The rules regarding saving energy are also changing. New technologies and shifting realities are showing us that what we once believed may need some rethinking. If you look at the list of energy-saving tips offered by experts just five or six years ago, the idea of duct sealing is virtually absent. Instead, we were taught that projects such as replacing windows or insulating walls were the most effective strategies for saving home energy. It’s not that experts didn’t know that leaks in the ductwork were the single biggest source of home energy waste. It’s just that there really wasn’t an effective solution to the problem. Sure, you could use tape or mastic to manually seal some of the leaks. But most of the ductwork is located behind drywall, under insulation or simply impossible to reach. So the problem was virtually ignored and advice to homeowners continued to focus on turning off lights and investing in Energy Star appliances. We were resigned to living in a world where the average home lost about 30 percent of its heating and cooling energy through leaks in the ductwork. It was this gnawing reality that set the wheels in motion for the search for an effective solution. Around 1994, the U.S. Department of Energy got together with the Environmental Protection Agency, several utilities and others to invest in the research needed to finally solve this problem. They asked the scientists at Lawrence Berkeley National Laboratory to come up with a way to seal leaks throughout the duct system – even those that were hidden behind walls or that were otherwise unreachable. In addition, the solution had to be safe for use inside occupied homes. 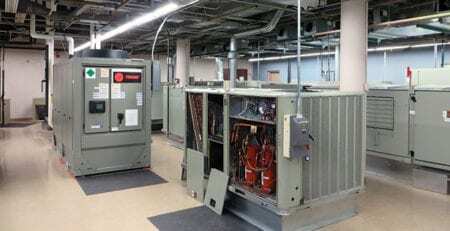 It had to work without negative interference with the proper operations of HVAC systems. It had to be easy to apply and it had to be cost effective to use. Quite a tall order. You can only imagine how daunting a task this mission originally must have seemed to the LBNL team assigned to coming up with the solution. Now that Aeroseal technology has arrived, the answer seems almost obvious. But it took real innovative thinking to literally flip the problem inside out in order to solve the puzzle. While traditional duct sealing methods work by covering leaks from the outside of the ductwork, the new approach would be the first and only solution to seal leaks from inside the ducts. If you could get small enough “sealers” to work inside the ducts, the entire system would be accessible. Walls and insulation would no longer be a concern. And that’s exactly what the researchers did. The “sealers” came in the form of an aerosol mist. From there, the science gets even more amazing (and beyond the scope of this piece) but suffice it to say, the final solution met all the criteria set out by the DOE and others. Aeroseal technology is safe, it doesn’t coat the interior of the ductwork – just around the leaks, it’s very effective and it pays for itself in 2.5 – 7 years (compared to windows at 70 years and wall insulation at 90). While duct sealing still is not on top of the list for most energy-minded Americans, it’s quickly getting there. Now that there is an effective/cost effective solution, the rules are beginning to reflect this new reality. 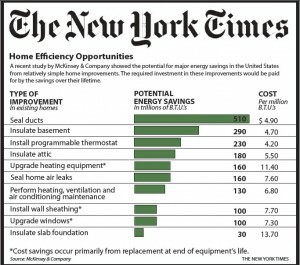 A growing number of energy advocates – from the DOE and the EPA to local utility companies and green building certifiers – have begun to add duct sealing as one of the (if not the single top) most effective things homeowners can do to reduce their energy bill and increase indoor comfort. Times change and innovations often reset the rules of the game. 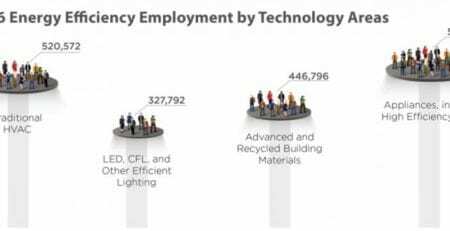 That is certainly the case when it comes to energy efficiency. 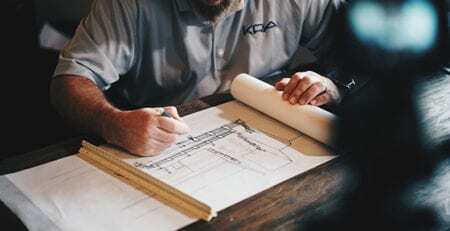 With effective duct sealing technology a reality, duct sealing has quickly risen to the top of the list of things we can do to reduce energy costs. It’s easy to have done, it’s highly effective and it provides one of the fastest ROI’s you’ll find for any home improvement project. Something to consider the next time you’re putting on a sweater and lowering the thermostat. Ohio State, Princeton, Syracuse Have a New B.M.O.C.